The Delaware River Waterfront Corporation spoke with residents of Pennsport and Queen Village last week about the new project on Washington Avenue. The Delaware River Waterfront Corporation continued public meetings with the Pennsport and Queen Village communities this week to discuss updates to the Washington Avenue Connector project, a major plan to revamp Washington Avenue from Columbus Boulevard to 4th Street. 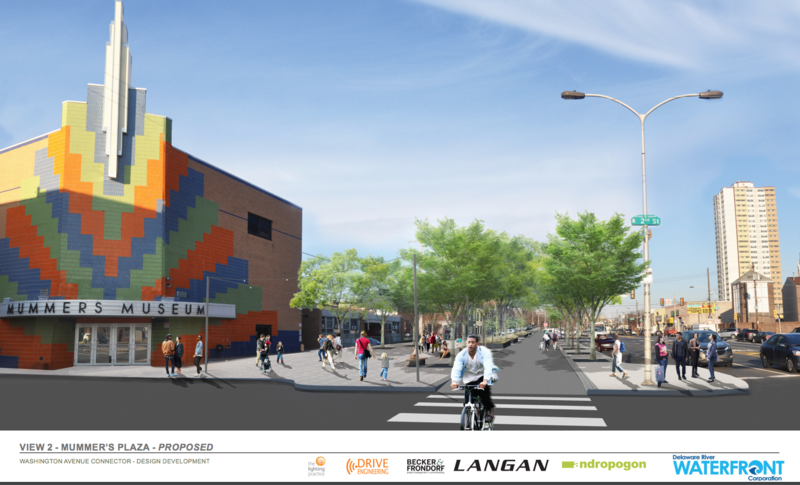 In partnership with Langan engineering, the William Penn Foundation-funded conceptual plan has been in the works since 2018, gaining input from various South Philly communities and city agencies for the last year. Currently, designs are still being finalized, with fundraising and implementation planned for 2020. 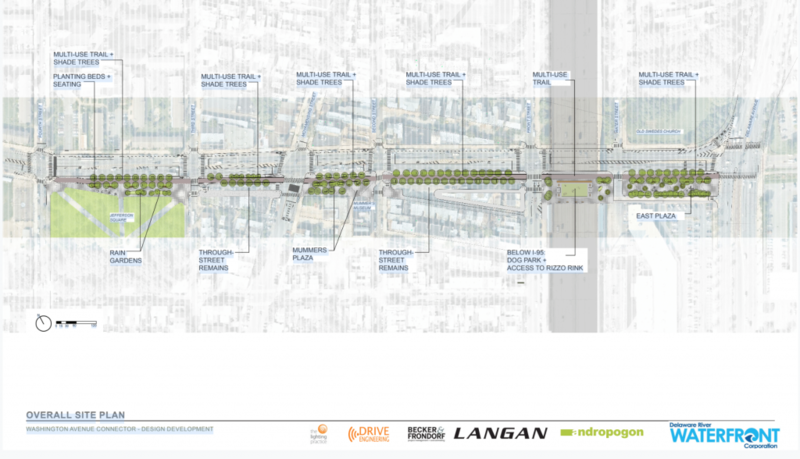 The colossal facelift, which is undergoing a construction documentation process, aims to “humanize and harmonize” Washington Avenue with designated lanes for various modes of transportation, improved traffic signals and timing and several pockets of greenery leading up the Delaware River waterfront. 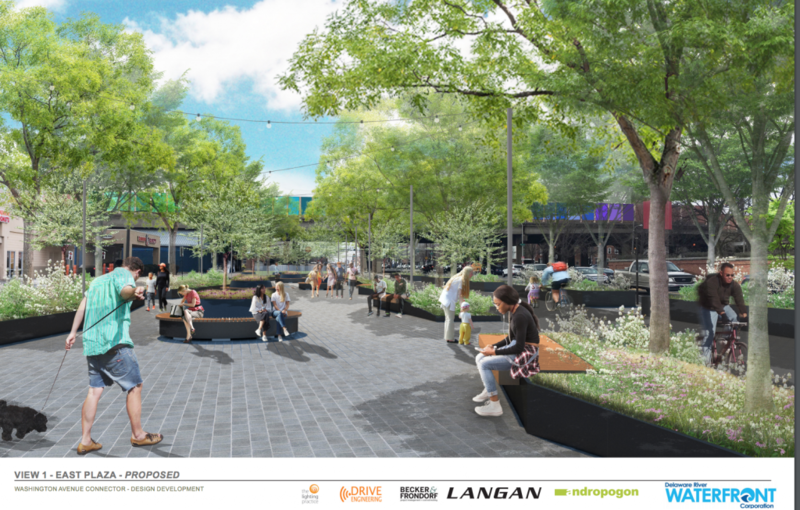 Starting at 4th Street, the master plan is comprised of pocket parks – an extension of Jefferson Park – every half-mile connected by a new stretch of transportation flow, including distinct lanes for buses and cars, protected lanes for bikers and a multi-use trail for pedestrians and runners. Along this assorted passageway, there will be a plaza performance space outside the Mummers Museum at 2nd Street and Washington Avenue, a dog park under the I-95 overpass and then, eventually, the East Plaza, a large public meeting space by Columbus Boulevard. Through community engagement, DRWC and Langan found that if the streetscape is revamped, the improvements would not only benefit connectivity but traffic safety, as they found that some of these secondary streets leading to Washington Avenue are prone to accidents, even noting that drivers will sometimes turn the wrong way on these streets just to get to the avenue. Through a traffic study, DRWC and Langan also found that drivers accelerate up to 50 mph along this stretch of Washington Avenue and then come to a screeching stop at red lights and stop signs. The plan aims to synchronize traffic signals and timings without reducing or adding any lanes. Some improvements include adding a raised crosswalk table to help slow down traffic turning westbound from Columbus Boulevard onto Washington Avenue and installing pedestrian islands with shorter crosswalks around this intersection. Naturally, parking concerns were raised by Pennsport meeting attendees, especially considering the plan intends to remove islands in the middle of Washington Avenue, which is often used for parking. But, the designers ensured that, after conducting a parking study, they will reserve certain streets and areas for parking. DRWC, the creative forces behind Spruce Street Harbor Park and Cherry Street Pier, strives to not only provide traffic safety but offer oases of recreation and greenery along the avenue. Outside the Mummers Museum, for example, the plan calls to extend the sidewalk where a stage will be installed for Mummery and other performances. Heading closer toward the river, the East Plaza will include sitting spaces and concessions. The well-lit dog park, designers say, is specifically intended to not only cater to canines but spur safety, as they found that residents fear potential crime under the I-95 overpass. Some meeting attendees made inquiries about security measures. Both Finch and Forkin say the additional lighting, coupled with more foot traffic, should naturally make the area less inclined toward criminal activity. Forkin says the DRWC has 24-hour security checks along the river on the eastside of Columbus Boulevard, and this patrol would move to the westside when the connector plan comes to fruition. Plus, he notes, that more maintenance crews will be on site, which adds another layer of eyes and ears. “You have more frequency of actual authorized personnel being within the area,” Forkin said. Some Pennsport residents say they’d like to see this project extend up to 6th Street along Washington Avenue, as they note this intersection is also dangerous for pedestrians and cyclists. Forkin notes that several of DRWC’s projects were a result of “incremental improvements,” additions to projects in response to positive feedback from the community. Following the implementation of the current design proposal to 4th Street, he says it’s possible the project could be extended.